After a week with full vigor will start the new Pro-Kart season. The first race on the May Day celebration 03.05.2014. at the Sports Complex SK333. Winter break has occurred some larger and smaller changes in the organizational format. 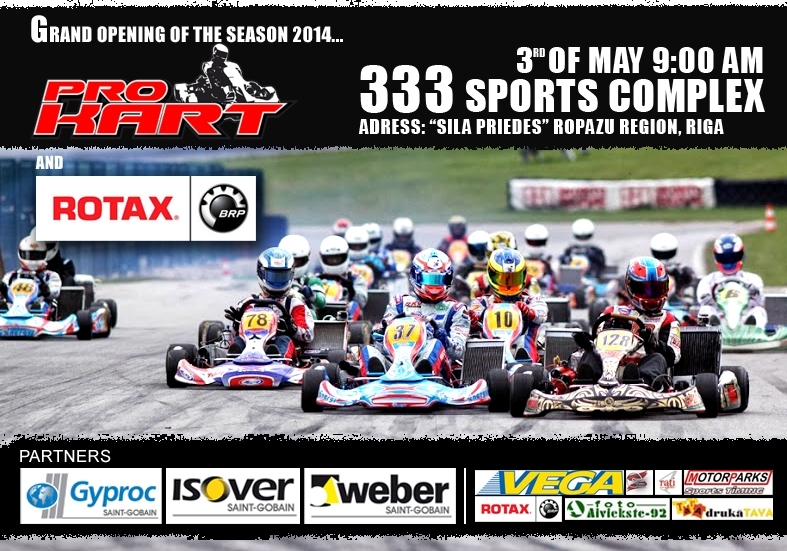 The most significant change associated with the Rotax Challenge Cup entering in the Pro-Kart race agenda. In this regard, please carefully fill out the Entry application form and choose the right class. All Rotax Challenge Cup classes are marked with magical letters "RM" and behind them followed by Junior, Senior, DD2 and DD2 Master. Example: if you want to start the Rotax Challenge Cup Junior category, then you need to choose a class "RM Junior". It is not allowed to participate in two categorys in the same time (Rotax Challenge or Pro-Kart), the decision must be done at the beginning of season in which clas You will compete for the overall standings. Pro-Kart class remained practically unchanged, but all participants are invited to get acquainted with the new technical regulations and competition regulations, to avoid unpleasant surprises during the race. If you have any questions or uncertainties feel free to contact the organizers (+371-29532998 +371-29532998 or prokart@prokart.lv) . It is likely that early in the season there will be some confusion , but please be perceived by the understandings and help top off all the imperfections!